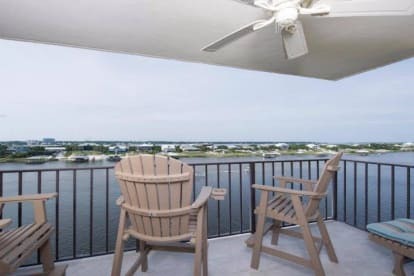 Nancy and Charlotte are the proud owners of this beautiful condo and wish to share it with others that enjoy vacationing in Orange Beach. Our unit offers the best of both worlds as it is located on Ole River and steps away from the beach. One balcony offers watching the dolphins play, boats coming up and down the river, and views of Ono Island. The other balcony offers a view of the beach and swimming pool. Our unit is fortunate to have two pools for you to enjoy. One in front of the unit and the other is on the beach across the street. The condo has been completely updated with upscale furnishings, artwork, and amenities. All stainless appliances in the kitchen and a full selection of tools for all your cooking needs. Each guest will have treats waiting on them upon arrival. Our goal is to exceed your expectations for your vacation!